Disclosure: This is a sponsored post as part of a campaign with the American Heart Association. As always, all opinions are always my own! I love New York and will always be a “city girl,” but the work culture here for the most part is like the Rihanna song, “work, work, work.” If you have time to breathe then apparently you’re not doing enough! Not getting enough sleep because you’re so busy is something people are proud of. Being stressed out seems to be a way of life. We’ve been led to believe some or all of this is normal, but it’s not true. Several studies and medical opinions have pointed out the obvious, that it’s not healthy and can have serious consequences, like heart disease, stroke and even death. As women we tend to take on too much. We overextend ourselves sometimes daily to our own detriment. We make sure our parents, friends and children make and go to their health checkups, and then we forget to schedule our own. As a new mom, I get it. I am experiencing a love so deep it hurts to even imagine anything going wrong with my son. I want to be there and protect him every second of the day, but I have to remind myself also that it’s ok to take 30 minutes just to myself everyday. I know if I’m not healthy, I’ll be of no use to him or anyone else. As much sense as that makes, I still struggle to find balance. The more I talk to other women and moms online, the more I learn I’m not alone, and that we all need help taking care of ourselves and not feeling guilty doing so. 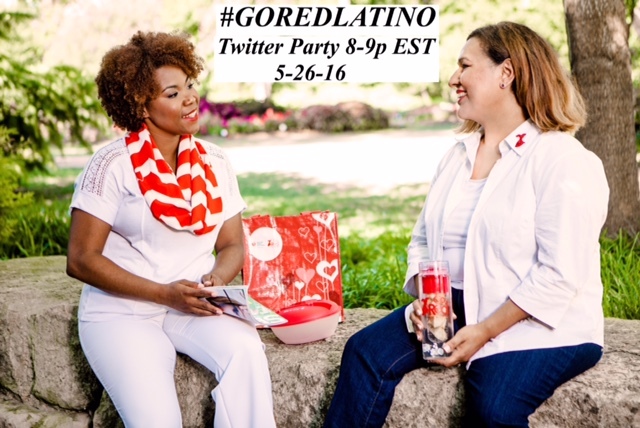 Let’s talk about this and more at the #GoRedLatino twitter party! 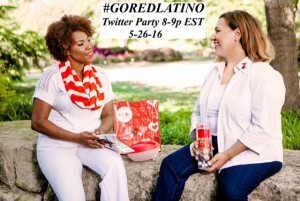 I hope you will join me on Thursday, May 26th at 8pm EST on twitter for our special #GoRedLATINO twitter party! Let’s discuss all of these points and more. We have three amazing blogger co-hosts Eileen Campos, Elayna Fernandez and Maria Castro. We are also joined by three special co-hosts, Dr. Johanna Contreras, cardiologist at Mount Sinai Hospital in New York City, Mariela Dabbah, award-winning founder of the Red Shoe Movement, and fitness expert and author Josette Puig, I am also giving away a few goodies throughout the twitter party, because who doesn’t like a giveaway!! DATES OF SWEEPSTAKES: The “Go Red LATINO” (the “Sweepstakes”) begins at 8:00 p.m. Eastern Time (“ET”) and ends at 9:00 p.m. ET on May 26, 2016 (the “Sweepstakes Period”). WINNING: There will be two (2) random drawings held on or about May 26, 2016. For the drawing, two (2) prize winners (each, a “Prize Winner”) will be selected at random from among all eligible entries received during the Sweepstakes Period. Odds of being selected as a Prize Winner depend upon the total number of eligible entries received during the Sweepstakes Period. The random drawing will be conducted by the Sponsor whose decisions are based upon their sole discretion and interpretation of these Official Rules and are final and binding in all respects. PRIZES: One Prize Winner will be awarded a gift card from Macy’s. The total Approximate Retail Value (“ARV”) of this Prize is $50. One Prize Winners will receive a Fitbit, the total Approximate Retail Value (“ARV”) of this Prize is $70. There will be a total of two (2) Prizes to be awarded for this Sweepstakes. The total ARV of all Prizes to be awarded in the Sweepstakes is: $120. No substitution or cash alternative will be provided for any Prize. Sponsor will not replace a lost, mutilated or stolen Prize. Sponsor reserves the right to substitute a Prize with a prize of comparable or greater value if Prize should become unavailable for any reason. Prizes are not transferable prior to award. The Prizes consist only of the items specifically listed as part of the Prize descriptions. WINNER’S LIST/OFFICIAL RULES REQUEST: For the name of the Prize Winners or a copy of these Official Rules, please submit an email no later than June 26, 2016 to [email protected] (please specify “Winners List” or “Rules Request” on the subject line of the email). Previous story The importance of setting goals!